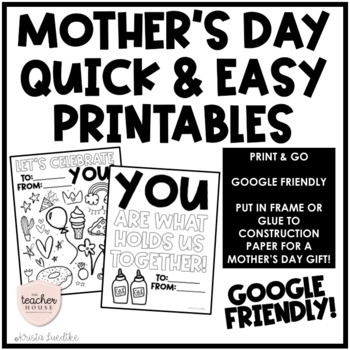 Quick & easy Mother's Day printables for your classroom. No color ink needed! These have been created to make your life easier with minimal prep work. 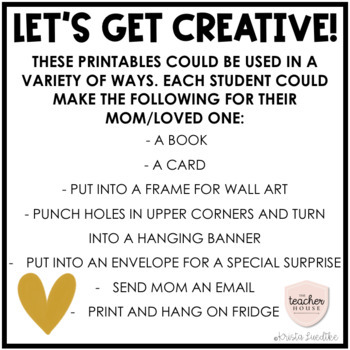 Just decide how you want your students to use the printables, print out, create, and send home to moms! P.S. There are options that don't include the word "mom" incase one of your students needs an alternative option. These easy Mother's Day printables could be used in a variety of ways. Here are some ideas for your students or class. Each student could make the following for their mom/loved one. I would love to see how you use these in your classroom! If you post to social media, please tag us so we can give you a shout out! Check out my Instagram @theteacherhouse to see items used in my classroom!